The EPNS is spelt incorrectly. Translation is made at near! Maybe this is what thy meant. Thus; I would assume that this platter is not Sterling Silver. Nina wasn’t notified about this. Nickel silver was first known and used in China. During the Qing dynasty, it was “smuggled into various parts of the East Indies”, despite a government ban on the export of nickel silver. It became known in the west from imported wares called bai-tong or paktong (白銅, literally “white copper”), for which the silvery metal colour was used to imitate sterling silver. According to Berthold Laufer, it was identical with khar sini, one of the seven metals recognized by Jābir ibn Hayyān. EPNS = Electroplated Nickel Silver. Pur silver is so weak, that it is plated over a harder metal to make it more usful….Albeit, less valuable. Pilkington in England first started manufacturing EPNS silver, and had a patent on the electroplating procsss for silver. So Hi Yo Silver to Y’all. Help stamp out spelling mistakes. The one who wrote that doesn’t deserve the hose but the cnout. Somebody is gonna catch Nell for this! Well, what c’n I say? Endorsed by Eneril Ragasse with a bam. Way to make a bad impression! 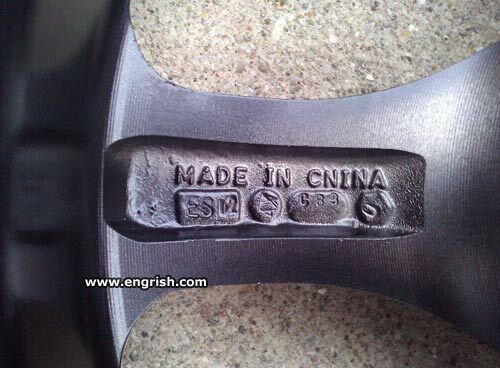 Not genuine engrish. It’s been forged.